In today?s discussion we will dive into form validation in spring, by the end of this tutorial we will be able to email validation, phone number validation and other spring form validation techniques. To implement spring form validation we need to create a separate Java class, all validation part will be covered in that file. 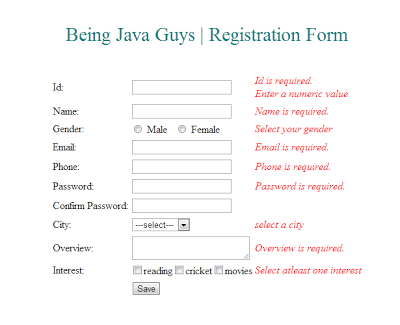 1) Simple Java Class to specify validation conditions and messages. Everything related to form validation in spring goes here. Create a simple java class and make it implement a pre defined interface so called 'Validator'. There are two methods in validator interface override them in your own class and write validation code in validate() method. 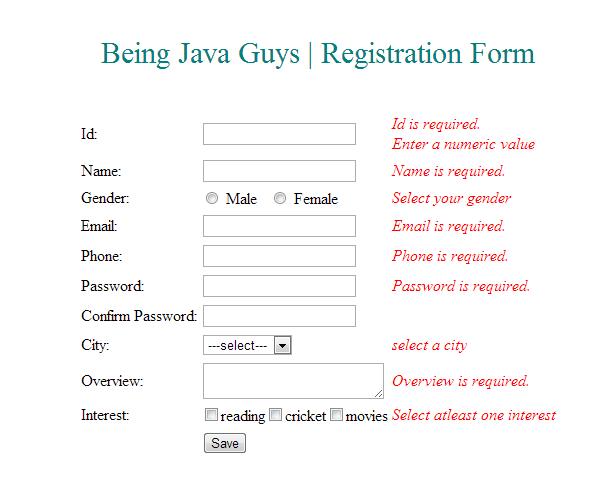 This is all about implementing form validation in a spring MVC application. A complete working example can be downloaded from Here. In today?s discussion we came across basic spring form tags and server side validation in spring forms. In upcoming tutorials we will see more about spring and other Java technologies.